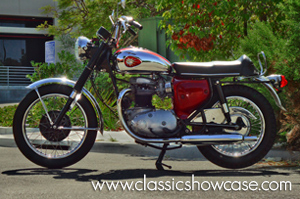 This is a numbers matching, all original bike that has been well maintained and kept up. It is hard to find a bike like this in very good condition with the patina of originality. A highly collectible bike. The BSA A65-A50 twins, the A65 being a 650 twin & it's smaller sister-bike the BSA A10 500 twin, were the natural result of the trend, then sweeping the British motorcycle industry, to unitize engine construction. Prior, most engine packages were made up of separate crankcase, primary case & gearbox, all bolted together in mounting plates inside the frame. Known then as Non-Unit construction, now as Pre-Unit, it had evolved from the earliest days of the motorcycle industry, when it was common for a motorcycle company to outsource engines & gearboxes from other firms & adapt them to their cycles. But, by the late 1950's the major makers were all using their own standardized components & the move was made to make engines lighter, more compact, stronger structurally (in theory, allowing more power with less vibration & flexing) & cheaper to produce. Hence Unit-Construction, which placed all 3 component sets in one common set of cases. It was only a matter of time before they converted their 650 twin over as well (this would take place in 1963). It was clearly time for BSA Motorcycles to take their successful line of vertical twins, the 500cc BSA A7 & the 650cc BSA A10. Both used the same design that was launched back in 1947 with the original BSA A7 cast iron twin. So, work was begun in earnest to develop a Unit-Construction replacement for their venerable line of Pre-Unit Twins. These would become the BSA A65-A50 line.